Note: This webpage is for instructional purposes only and the scenario described below is fictional. We, members of the Sierra Club, have studied the United State’s agricultural subsidies and want to present our findings to the Conference Committee (Figure 1). As an environmental group that has helped pass the Clean Air Act, Clean Water Act, and the Endangered Species Act, we think that subsidies should be feasible, efficient, and effective in supporting environmental goals (Sierra Club, 2018). The Sierra Club has commissioned our team to explore these policies to determine the impact that subsidies have and determine alternatives to include benefits for the environment, farmers and consumers, and the government. To convince Conference Committee, the Senate, the House, and the President of the importance of adjusting subsidies to fulfill these goals, we have included the economical and social aspects of subsidies that could benefit the economy and social welfare of the United States. Subsidies are a complex subject because they affect consumers and producers both directly and indirectly through systems including cost of production, national and international market fluctuations, and the relationship between agriculture and climate change.Subsidies are any payment that provides an incentive for a farmer to grow a specific crop or conduct a particular “best management practice” or to keep prices low for customers. These governmental payouts attempt a more stable market place so that uncontrollable events, such as droughts or extreme storms, do not put farmers out of business. This paper analyzes the sustainability of these subsidies. Sustainability will be analyzed under three categories: economics, environment, and society. This literature review has determined that the current subsidy system needs to be re-evaluated and adjusted to optimize all three categories. US subsidies favor mass production and maximum usage of land, leading to the depletion of resources, while promoting pesticide and fertilizer usage that has negative effects on the environment. The economic aspect of subsidies are supposed to support farmers to grow their business, while maintaining a stable market for consumers and producers. However, farmers may not want to produce the products that are being subsidized, while consumers cannot afford the products that are not subsidized, exacerbating the societal effect of subsidies. The agricultural subsidies have the potential to be an effective and efficient way to distribute financially attainable and nutritional products, but policy-makers need to shift the focus of the goals of subsidies towards sustainability. (a) SHORT TITLE. - This Proposal may be cited as the "The Sustainability of US Subsidies". Sec 1. Short title; table of contents. Sec 2. Definition of Sustainability. Sec 3. Definition of Wicked Problem. Sec 4. Triple Bottom Line Model. Sec 5. Definition of Subsidies. Sec 6. Brief History of US Subsidies. Sec 7. Description of the Methods utilized to justify proposed changes. Sec 8. Evalutation of Environmental Applications of Subsidies. Sec 9. Evalutation of Societal Applications of Subsidies. Sec 10. Evalutation of Economic Applications of Subsidies. Sec 11. Results of Study. Sec 12. Limitations of Study. In this Proposal, the term "Sustainability" means meeting the needs of the present without compromising the well-being of future generations, through environmental, economical, and societal aspects (Sustainability Degrees, 2018). The concept of sustainability is a complex, elusive, and wicked problem. In this Proposal, the term "Wicked problems" mean the presence of: no definitive formulation of the problem of the inefficiency of subsidies, solutions are neither true nor false, and the stakeholders, namely farmers, consumers, and the government, have very different perspectives on this problem (Peterson, 2013). Underlying cause and effect relationships related to the problem are complex, systematic, and either unknown or highly uncertain. In this Proposal, the term "Triple Bottom Line Model" means the interactions environmental, economical, and societal sustainability. 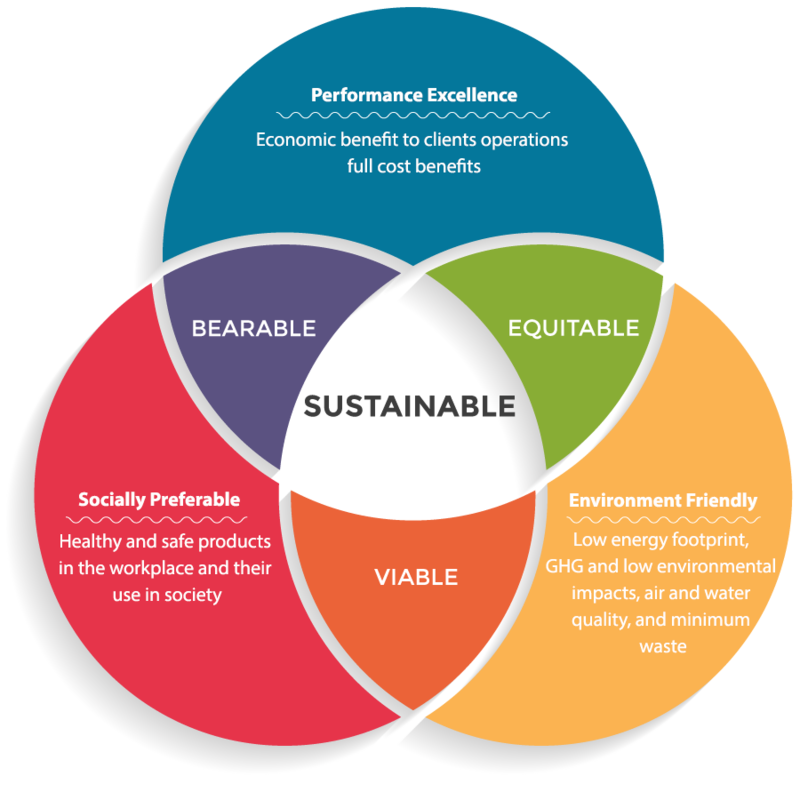 The triple-bottom line illustrates that an activity or program is sustainable when it meets the goal of all three categories (Figure 2). This model allows for the analysis of activities to address their strengths and weaknesses. 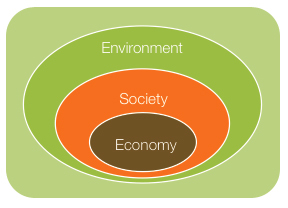 This model illustrates that the economy cannot be optimized until both the social and environmental aspects are maximized. Triple Bottom Line Nested Model. In this Proposal, the term "Subsidy" is an “economic benefit or financial aid provided by the government to support a desirable activity, keep prices of staples low, maintain the income of producers of critical or strategic products, maintain employment levels, or induce investment to reduce unemployment” (Amadeo, 2018). Subsidies are primarily an economic stabilizer designed to allow farmers to continue to produce their products without fear of market crash due to their risky employment environment. Historically, subsidies were implemented to support farmers as a risk management policy during the setup of the New Deal programs (Schapsmeier, 1992). Without subsidies, some farmers would not be able to take the risk of market failure where the costs are too low for efficient and effective crop production. Subsidies are not a ‘one size fits all,’ they vary from government to government and different subsidies benefit different sized farms. The United States funds over 1,500 programs, spending almost $2 trillion across them, many of which relate to agriculture and nutrition (IDILOGIC, 2018). The United States Department of Agriculture (USDA) views agricultural subsidies as price support for farmers as well as a support program for consumers. Under Farm Storage Facility Loans, the USDA breaks down which products are eligible, namely corn, grain sorghum, wheat, oats or barley, along with, fruits and vegetables in cold storage facilities and unprocessed meat/poultry. In order for the farmer to be able to procure this loan, they need to be able to prove that they will be able to repay and meet the other requirements for the loan (McConnell, 2016). The government also has mandatory spending for organic agricultural products under the conservation, research, horticulture, and crop insurance titles (USDA, 2017). The United States subsidies do not just impact its citizens through the price of food, but also international markets and their citizens through price competition and food aid. What is the goal of agricultural subsidies? Do you think that consumers and producers are still benefiting from these programs? How are international markets affected by the subsidies in the US? Do you see any way for the subsidies to be more efficient and effective at reaching their goals? How do farmers feel about subsidies? Where can research of subsidies improve? Increased U.S. energy independence through the use of alternative fuel (Gustafson, 2010). Filling a 25-gallon tank of an SUV requires over 450 pounds of corn, which contains enough calories to feed one person for a year (Runge, 2007). Dedicating all U.S. corn and soybean production to biofuels would meet only 12% of gasoline demand and 6% of diesel demand (Hill, 2006). The Supplemental Nutrition Assistance Program (SNAP) subsidizes vegetables to make them more affordable to low income families (Choi, 2017). However, not allowing a free market for farmers to compete for better prices, via supply and demand. It must not be overlooked that larger, corporate farms are dominating the system and although farmer salaries may be stable, it may not include those farmers that have been put out of business. Subsidies must cut back and redistribute accordingly. These subsidies are not fulfilling their economical goal for farmers, the government, or consumers. The studies analyzed in this paper found that only six of the twenty-one articles analyzed found the current subsidies sustainable in at least one aspect. Subsidies do not fulfill the triple bottom line model, but they have the potential to be evironmentally, econmically, and socially sustainable. The findings in this study are important because the goals of the subsidies in the US are not being met and in some cases are causing more harm than good. The subsidies need to be adjusted to meet the needs of farmers and consumers to affect positive change on national and international markets. Project-specific, conservation efforts. Conservation project dependent on the regional land or watershed needs. Table 2: Summary of agricultural subsidy types. Source: Edwards (2016). Table 3: Article summary of the sustainability of subsidies. Limitation 1: All articles found via the University of Wisconsin-Madison library, which may have bias towards the promotion of healthy, non-staple foods and environmental health. Limitation 2: No studies have directly researched the sustainability of subsidies under the triple bottom line model. Limitation 3: There is a lot of information on subsidies and this study was not able to include all of it. Limitation 4: Subsidies are a very complex, Wicked Problem, readers are encouraged to reference the sources provided to find more information. Subsidies have the potential to be environmentally, economically, and socially sustainable, but these policies need to be re-evaluated to better reach these goals. Majority of the studies found subsidies to be unsustainable in all three categories. These results show that agricultural subsidies in the United States need to be analyzed and re-focused on the goals that they set out to promote. By incorporating the idea of sustainability, the government will be able to allocate their resources effectively and efficiently, improving the environment, economy, and societal standing of the United States. Future research can focus on specific subsidy programs to analyze their individual sustainability (Figure14). Environmental Aspects: The government should look into the sustainability of using first generation versus second generation biofuels. Second generation biofuels may decrease the competition that biofuels have on production of food, as well as increase the net gain of energy compared to first generation biofuels. The Farm Bill currently dedicates about 8% of its funding to conservation programs, however, with the increasing need for conservation, this percentage should increase in the next Farm Bill. Additionally, the amount of fertilizer used should not be in excess, due to the harmful environmental effects it may have if contaminated into waterways and the degradation of the soil. Therefore, there could be some sort of financial incentive to use only as much fertilizer as needed, to avoid overuse, waste, and unnecessary harms. Social Aspects: The government should re-evaluate the contradicting goals of their healthy nutrition guidelines and the most heavily subsidized food crops. If the government has goals and guidelines for America to eat healthier in aim to decrease the rate of increasing chronic disease, the funding of the Farm Bill should reflect that goal by allocating funds to food crops that do not get processed into unhealthy food options. Although the Farm Bill is successful in funding the SNAP program, this program only encourages choice and does not guarantee that healthier foods will be purchased. There are programs through SNAP such as double dollars for fresh produce, but ultimately it is the consumer choice, which is financially influenced. If fresh produce was cheaper to begin with, the consumer may be more likely to purchase the fresh produce as it is price competitive with the other cheaper, processed foods that are heavily subsidized. Economic Aspects: The Farm Bill needs to support farmers while providing affordable healthy food to consumers. Subsidies need to be re-distributed to support all farm types and a diversified crop production. The government needs to ensure that the needs of small farmers are being met, despite the pressure from large companies to continue ‘business as usual’. While the market will remain distorted as long as subsidies exist, the Farm Bill can establish a more equitable flow of funds to support farm production while monitoring the demand of consumers to provide a more stable, demand-reflected market. The international impacts of subsidies can also be addressed in the upcoming Farm Bill, the government should be aware of the aftermarket effects of food aid and overproduction. The United States should continue to supply countries in need with food aid, but also support their farmers to encourage regrowth and food independence. the economic pillar can work more efficiently if subsidies “[lower] the income and total payment limits so the large/rich [farms] do not get as much of the ag[riculture] support” (Mitchell, 2018). By making these amendments to the Farm Bill, Congress will begin to increase the sustainability of subsidies. As the Conference Committee, it is your duty to emphasize the findings of this study and continue to make changes to ensure that the subsidies provided by this government are sustainable for future generations. Alston, J. M., et al. (2016). "The Economics of Obesity and Related Policy." Annual Review of Resource Economics, Vol 8 8: 443-+. Amadeo, Kimberly (2018). “Government Subsidies (Farm, Oil, Export, Etc. ).” Fiscal Policy: The Balance. An, R. P. (2013). "Effectiveness of subsidies in promoting healthy food purchases and consumption: a review of field experiments." Public Health Nutrition 16(7): 1215-1228. Atiq, Shariq. (2013). “Agricultural Subsidies.” Department of Agriculture. Beghin, J. C. and H. H. Jensen (2008). "Farm policies and added sugars in US diets." Food Policy 33(6): 480-488. Belprez, Whitney. (2018). “The End of the Road.” Two Sparrows Farm and Dairy. Breslin, Edward D. (1994). “U.S. Aid, the State, and Food Insecurity in Rural Zimbabwe: The Case of Gokwe.” 32(1): 81-110. Brown, Ben. (2010). “Sustainability’s Triple Bottom Line: Tool for Commit-a-Phobes?” Word Press. Cato Institute. (2011). “Understanding the Politics of Food.” The Economist. Chaturvedi, Venkatesh, et al. (2013). “An Overview of Key Pretreatment Processes Employed for Bioconversion of Lignocellulosic Biomass into Biofuels and Value Added Products.” Biotech. 3(5): 415-431. Choi, S. E., et al. (2017). "Cost Effectiveness of Subsidizing Fruit and Vegetable Purchases Through the Supplemental Nutrition Assistance Program." American Journal of Preventive Medicine 52(5): E147-E155. Claassen, Roger. (2016). “Conservation Spending Seeks To Improve Environmental Performance in Agriculture.” United States Department of Agriculture. Cong, R. G. and M. Brady (2012). "How to Design a Targeted Agricultural Subsidy System: Efficiency or Equity?" Plos One 7(8). Degorter, H. and D. R. Just (2010). "The Social Costs and Benefits of Biofuels: The Intersection of Environmental, Energy and Agricultural Policy." Applied Economic Perspectives and Policy 32(1): 4-32. Degorter, H. and E. O. Fisher (1993). "The Dynamic Effects of Agricultural Subsidies in the United States." Journal of Agricultural and Resource Economics 18(2): 147-159. Devadoss, S., et al. (2016). "The Impact of Agricultural Subsidies on the Corn Market with Farm Heterogeneity and Endogenous Entry and Exit." Journal of Agricultural and Resource Economics 41(3): 499-517. ERS. (2017). “Ratio of Farm to US Average Household Income.” 2017 Farm Income Forecast. Environmental Working Group (EWG). (2018). “Farm Subsidy Primer.” Farm Subsidy Database. Edwards, Chris (2016). “Agricultural Subsidies.” Downsizing Government. Cato Institute. Farm Policy Facts. (2018). 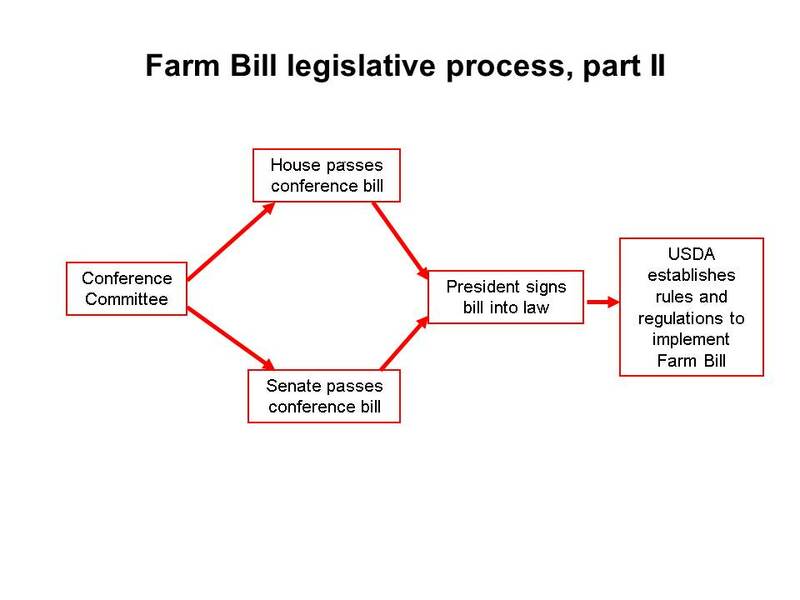 “A Short History and Summary of the Farm Bill.” Farm Bill. Farrell, Keith. (2017). “The Politics of Corn.” Bankable Insight. Fisher, E. O. and H. Degorter (1992). "The International Effects of United States Farm Subsidies." American Journal of Agricultural Economics 74(2): 258-267. Ganzel, Bill. (2007). “Fertilizer.” Living History Farm. Gittelsohn, J., et al. (2017). "Pricing Strategies to Encourage Availability, Purchase, and Consumption of Healthy Foods and Beverages: A Systematic Review." Preventing Chronic Disease 14. Gustafson, Cole. (2010). “History of Ethanol Production and Policy.” North Dakota State University. Hicks, Susan. (2014). “Energy for Growing and Harvesting Crops is a Large Component of Farm Operating Costs.” Today in Energy. Hill, Jason., et al. (2006). “Environmental, economic, and energetic costs and benefits of biodiesel and ethanol biofuels.” Proceedings of the National Academy of Science of the United States of America (PNAS). Hoffman, W. L., et al. (1994). "The Impact of Food Aid on Food Subsidies in Recipient Countries." American Journal of Agricultural Economics 76(4): 733-743. IDILOGIC (2018). “List of US Federal Government Funding Programs.” Aidpage: People Network. Johns Hopkins. (2014). “Industrialization of Agriculture.” Food Production. King, Wes. (2018). “2018 Farm Bill: Federal Efforts to Advance Equitable & Sustainable Food Systems.” PolicyLink. Krueger, Jill. (2011). “How the Farm Bill Affects Public Health. The Network for Public Health Law. Larsen, Janet. (2012). “Grain Harvest.” Earth Policy Institute. Lusk, J. L. (2017). "Distributional Effects of Crop Insurance Subsidies." Applied Economic Perspectives and Policy 39(1): 1-15. Marati, Jessica. (2012). “10 Infographics on Farming and Agriculture.” Ecosalon. McConnell, Michael (2016). “Sugar-Sweeteners: Policy.” United States Department of Agriculture: Economic Research Service. Milazzo, M.F., et al. (2013). “Soy biodiesel pathways: Global prospects.” Renewable and Sustainable Energy Reviews 26(1): 579-624. Mitchell, Paul. (2016). “Farm Programs.” Lecture at the University of Wisconsin-Madison. Lecture at the University of Wisconsin-Madison. Mitchell, Paul. (2018). Department of Agriculture and Applied Economics. University of Wisconsin - Madison. Mozaffarian, D., et al. (2014). "The Real Cost of Food Can Taxes and Subsidies Improve Public Health?" Jama-Journal of the American Medical Association 312(9): 889-890. Nestle, Marion. (2016). “The Farm Bill Drove Me Insane.” Politico. Oaklander, Mandy. (2016). “Many Foods Subsidized By the Government Are Unhealthy.” TIME Health. Pearson-Stuttard, J., et al. (2017). "Reducing US cardiovascular disease burden and disparities through national and targeted dietary policies: A modelling study." Plos Medicine 14(6). Penalvo, J. L., et al. (2017). "The potential impact of food taxes and subsidies on cardiovascular disease and diabetes burden and disparities in the United States." Bmc Medicine 15. Peterson, H.C., (2013). “Sustainability: a Wicked Problem.” Sustainable Animal Agriculture. CAB International. Plumer, Brad. (2014). “The $956 billion farm bill, in one graph.” The Washington Post. Ramadan, R. and A. Thomas (2011). "Evaluating the impact of reforming the food subsidy program in Egypt: A Mixed Demand approach." Food Policy 36(5): 638-646. Roberts, K. E., et al. (2017). "A rapid review examining purchasing changes resulting from fiscal measures targeted at high sugar foods and sugar-sweetened drinks." Nutrition & Diabetes 7. Runge, C. F. and B. Senauer (2007). "How biofuels could starve the poor." Foreign Affairs 86(3): 41-+. Saitone, T. L., et al. (2008). "Market power in the corn sector: How does it affect the impacts of the ethanol subsidy?" Journal of Agricultural and Resource Economics 33(2): 169-194. Schapsmeier, E. L. and F. H. Schapsmeier (1992). "Eisenhower and Agricultural Reform - Ike Farm Policy Legacy Appraised." American Journal of Economics and Sociology 51(2): 147-159. Skidmore, M., et al. (2013). "The Political Economy of State Government Subsidy Adoption: The Case of Ethanol." Economics & Politics 25(2): 162-180. Stoelglehner, Gernot, et al. (2009). “How Sustainable are Biofuels? Answers and further questions arising from an ecological footprint perspective.” Bioresource Technology 100: 3925 - 3830. Stuart, D., et al. (2014). "Reducing nitrogen fertilizer application as a climate change mitigation strategy: Understanding farmer decision-making and potential barriers to change in the US." Land Use Policy 36: 210-218. Sustainability Degrees (2018). “What is sustainability?” SustainabilityDegrees. Thow, A. M., et al. (2010). "The effect of fiscal policy on diet, obesity and chronic disease: a systematic review." Bulletin of the World Health Organization 88(8): 609-614. United States Department of Agriculture (USDA) (2017). "Economic Research Service." USDA. USDA. (2016). “Supplemental Nutrition Assistance Program (SNAP).” Food and Nutrition Service. United States Department of Energy (USDE). (2007). “Case Study: Ethanol Vehicle Emissions.” Corn and Ethanol. Van den Berg, Maarten. (2017). “Triple Bottom Line: Measuring Social and Environmental KPIs.” ChainPoint. Veer, PG. (2015). “The Farm Bill: One Giant Redistribution of Wealth.” Watchdog. Wallace, Siobhan. (2014). "The 2014 Farm Bill." The Farm Bill. Wattiaux, Michel. (2018). “Subsidies.” Food Production Systems and Sustainability. This project would not have been possible without the support of Professor Paul Mitchell, Professor Wattiaux, Ginny Moore, and our peers. Samantha Vosters: From Chippewa Falls, WI studying Biology and Environmental Sciences and a Certificate in Global Health at the University of Wisconsin-Madison. April Hommerding: From Sun Prairie, WI. Studying Conservation Biology and Environmental Studies at the University of Wisconsin-Madison.